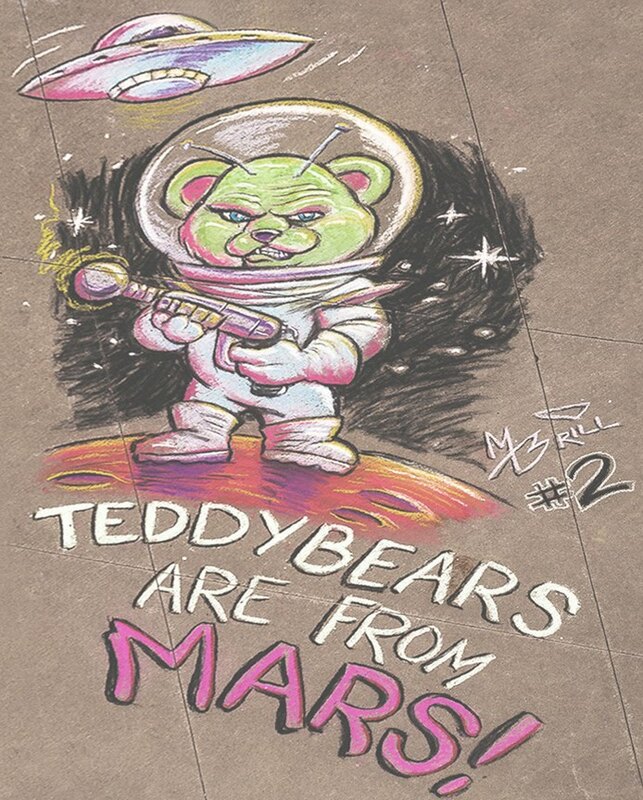 THE BRILLUSTRATOR: MARS NEEDS TEDDYBEARS! So, this last weekend the Tacoma Art Museum hosted an event they were calling the Iron Artist Chalk Off! 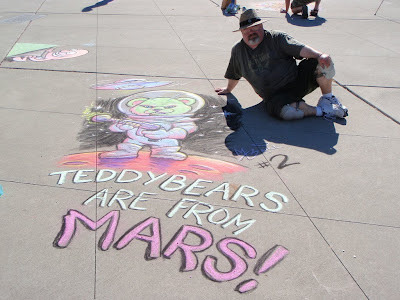 It was held across the street from the museum on a vast stretch of concrete called Tollefson Plaza in lovely downtown Tacoma, and above are pictures of the piece I labored mightily to produce. As it turns out, "Iron Artist" was a good name for the event because August 4th turned out to be one of the hottest days this year--at least as far as the Pacific Northwest is concerned. And crawling around on 10,000 square feet of brightly radiating concrete, only made it worse! We were absolutely sweltering! There was virtually no shade at all--although I did post myself next to a little tree in a planter so I'd have access to a tiny patch of shade--but after two and a half hours' work, I was about at the end of my meager resources. I should have made the blackness of space around the figure darker and more completely filled in, but by that time my hands were shaky and I could barely keep a grip on the charcoal! When I got home my face was as red as a beet, for all I wore a protective hat. And I paid for this folly over the next couple of days as my leg and arm muscles forcefully reminded me that they are not used to this kind of exercise! 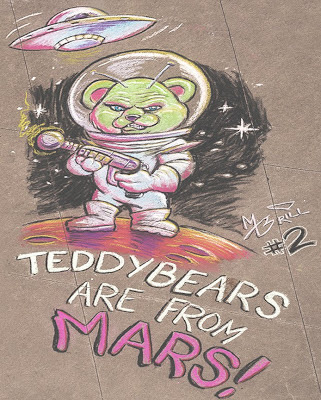 But I managed to finished my "Teddybears Are From Mars!" design, which I did partially in honor of the upcoming Mars landing. 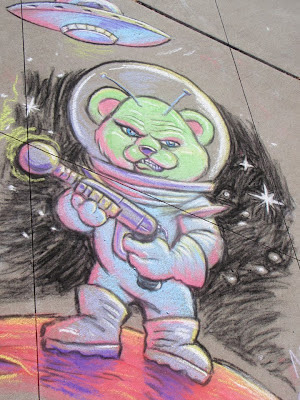 It came out pretty good, and considering that this is only my third chalking event ever and that I had no clear idea in mind before I began this odyssey, I was fairly satisfied with the result. Thanks to Mark Monlux, (www.markmonlux.com) and Vince of Darkain Multi-Media (www.darkain.com) for taking photos which I have shamelessly re-posted here. Excellent work, Mark. I don't think I could have withstood the heat of the day. That Martian bear looks pretty formidable though!